You are here: Home / The Best Website Builder For Your Website / Shopify vs Big Commerce: Which Is Best For Your Online Store? 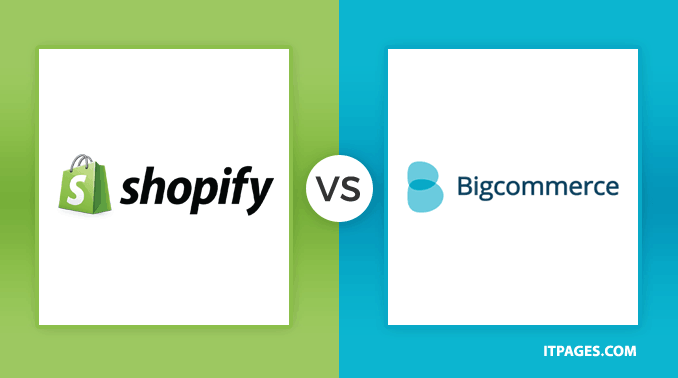 Shopify vs Big Commerce: Which Is Best For Your Online Store? Both Shopify and Bigcommerce are website builders designed for online store owners—after all, it's built right into their names. But with both options having a similar focus, which one is the better choice for online retailers? Both have similar feature sets designed for eCommerce—if this were a race, one would only be a few seconds behind the other. Further to our review of Shopify and our review of Bigcommerce, here are the pros and cons of using each product. 5 Bigcommerce: Who is it best for? 6 Shopify: Who is it best for? 7 So, who wins? Shopify or Bigcommerce? Most eCommerce platforms use a field-based system where the user just has to type the right information in the right boxes. Shopify follows this set-up. Adding products is simply a matter of inputting information. Pages, on the other hand, are a bit more difficult—some of the edits for the home page, for example, are completed under the Page option, while graphic options are actually listed in the Theme options. It's a bit confusing at first to have to use two separate areas of the website builder to edit a single page. For the most part, Bigcommerce also uses a field-based system, where users just type all the information into boxes to add a product. The difference is that Bigcommerce also offers a What You See Is What You Get editor for products too, where you see each change you make as you make it. The WYSIWYG version allows users to customize their product pages a bit more than simply adding products. The system, overall, also seems a bit simpler to use. Bigcommerce wins out here, since the platform is a bit simpler and offers additional customization with a WYSIWYG editor. Bigcommerce offers 16 free design templates, plus the option to choose from much more paid templates. All of the themes are definitely built for online stores—products are prominent, with options for arranging categories and promoting specials in a slideshow header. Many options are also responsive, meaning it will look just as nice on a small screen. Shopify offers about twice as many free designs, with a wide selection of paid templates as well. Again, the themes are designed for online stores, with product organization as a key element. Designs range from casual to elegant, and most appear to be clean and modern. Most of the free templates also appear to be responsive, so it's not necessary to design a separate mobile site. Both platforms offer modern, responsive themes—but Shopify does have more free options than Bigcommerce. With both platforms designed for eCommerce, there are plenty of features designed for retailers. Shopify's biggest draw is that it has its own Point of Sale (POS) system (allowing users to make in-person purchases with tools like credit card scanners and barcode scanners), which is included in the package price. The POS system can be used to easily sell in-person, and have your Shopify inventory automatically update, so business owners with a brick-and-mortar store don't need to track inventory separately. There's a full list of features for eCommerce as well, including coupon codes, abandoned cart recovery, and analytics, though some require purchasing the more advanced package. Bigcommerce doesn't have their own POS system; you can add one with a third-party app, but we're not convinced that has the same features as Shopify's built-in option. Bigcommerce seems to have thought of everything when it comes to storage options though—online stores can display swatches of the different color variations and even offer gift wrapping. If you have a brick-and-mortar store or occasionally sell in person at craft markets, Shopify's POS system is a big draw, otherwise, we rather like the wide range of product options on Bigcommerce. Shopify plans range from $14-179 a month, depending on exactly what your needs are. $29 gets you unlimited products, the POS system, and discount codes. $79 a month adds on 5 GB of storage, gift cards, analytics and abandoned cart recovery, while the full $179 offers every feature Shopify has available. Using Shopify payments, there are no transaction fees, but when customers pay with a credit card, Shopify takes a percentage of that, ranging from 2.9 percent plus thirty cents to 2.2 percent, with that percentage dropping with the pricier monthly subscriptions and for in-person sales on the POS system. Bigcommerce plans start at about $30 a month—but even the basic package includes unlimited products, storage, and bandwidth. The basic option is also the only one with a transaction fee, and that's just 1.5 percent. The $80 a month option gets you real-time shipping, an abandoned cart saver and more. Bigcommerce will also go above that with a custom plan for large businesses. The prices between the two are pretty similar—but Bigcommerce offers unlimited storage and products across all their plans and has lower transaction fees when customers use a credit card. Bigcommerce also doesn't offer their own POS system, so any third party POS monthly fees would be extra. Bigcommerce: Who is it best for? When just comparing the web building platforms themselves, we preferred Bigcommerce, though not by a large margin. It's easier to use and yet still seems to have more tools and options. If you're looking to have options like gift wrap and product swatches, and don't sell in person, Bigcommerce is the better choice, plus it also has lower transaction fees. Shopify: Who is it best for? Shopify's platform is still an excellent one, we just found it to have a slightly higher learning curve to get started. But, Shopify offers a POS system that will manage inventory for both online and in-person sales in one place—and that convenience is enough to propel Shopify ahead just a bit. If you also own a brick-and-mortar store or occasionally sell at fairs and markets, the POS system is a good reason to choose Shopify, since the two platforms are very close when comparing ease of use and eCommerce features. So, who wins? Shopify or Bigcommerce? Bigcommerce is easy to use, has the most features and the lowest transaction fees. For those who are selling just online, it's an excellent platform. While there are POS systems available for Bigcommerce, they are through third-party apps. Shopify, on the other hand, has a fully integrated POS system with tools available from scanners to receipt printers. With the two being so closely ranked, Bigcommerce is the winner for businesses that operate solely online, while Shopify is the winner for a business that needs a POS system. Overall both platforms are excellent for eCommerce and offer incredible value for money.